ORANGE YOU GLAD YOU TRIED IT? It was another week and we had to take on two more flavors. We needed to stay on schedule if we want to hit them all before the season ends. Must. Eat. Ice. Cream. 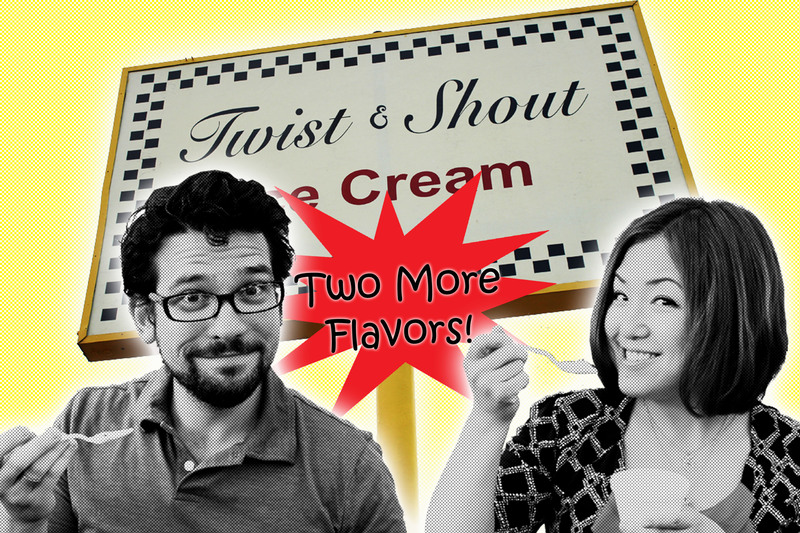 We have been purposely avoiding the really weird flavors like cotton candy and licorice. We’ll get to them soon enough, but I think we both were looking for something we wereÂ really going to like. I think we did pretty well this week. This flavor was a big surprise to me. I don’t like butter pecan. It’s my personal opinion that nuts don’t belong in ice cream. I think they should be forbidden. Yes, I said it. But I do realize that many people love nuts in their ice cream, and I respect that. They just aren’tfor me. It’s really not a flavor thing; it’s texture thing. Ice cream is so smooth and creamy and then whoa, this oddly shaped pecan or walnut comes out of nowhere and just ruins the experience. Anyway, if you’re like me, you might like this flavor. I was very surprised that I actually liked butter pecan! The good thing about eating it soft serve style was there are no nuts! It was great! You got all the creamy buttery pecan goodness without the “did I just break a tooth?” feeling. Aya likes nuts in her ice cream and missed them in the soft serve, but even she seemed to like this flavor. We both rated it at a strong four plastic spoons. Yes! This was awesome! Maybe I’m partial because oranges are one of my top three favorite fruits, but this was really good. When I get ice cream I always have to make that difficult decision. Am I in a fruit mood? Or a chocolat-ish mood? I must have been in a fruit mood when I tried the orange because it totally hit the spot. I was really expecting something more like an orange sherbet flavor, but holy orange panda bear!, it was like an orange creamsicle. Vanilla and orange blended into a creamy blissful orangy fruit flavored marriage. I rated it at five plastic spoons! Aya claims she gave it two spoons, but I’m pretty sure I heard her say five. I’ll guess you’ll just have to try it and taste for yourself.